In a recent (January 22, 2011) story, the Graduate Studies at Dartmouth College in Hanover, New Hampshire, has adopted a new "coat of arms" to replace its earlier "logo." 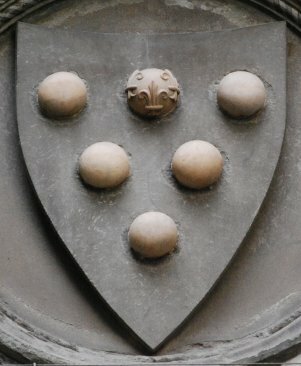 As nearly as I can make out from the story (found on-line at http://www.dartmo.com/archives/1289), the "logo" was placed within an oval; while the new one, because it's placed in a standard heater shield shape, must therefore be a "coat of arms." Oh, well, I suppose I should be grateful that they didn't call it a "crest." 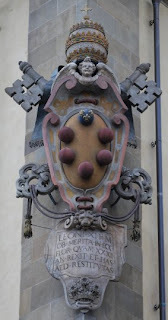 I didn’t have to walk around Florence to see this next coat of arms – it actually drove right past me! 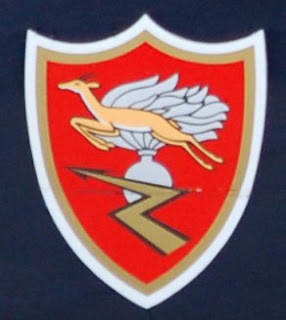 This bit of heraldry was painted on the side of one of the Alfa-Romeo automobiles used by the Carabinieri, or more fully, Arma dei carabinieri, which is the national gendarmerie of Italy, policing both the military and civilian populations. 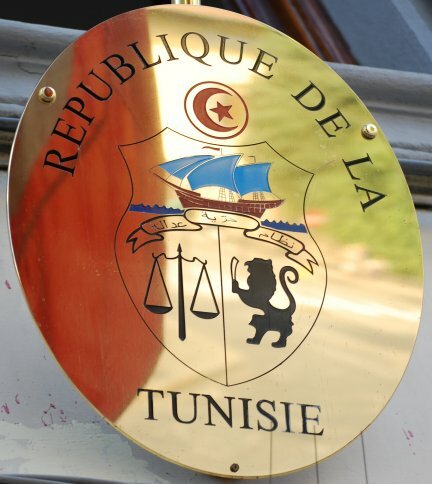 The main charge on the coat of arms is a grenade, a charge which is also used by the French Foreign Legion. The gazelle is presumably related to the organization’s mandate to quickly respond when needed. 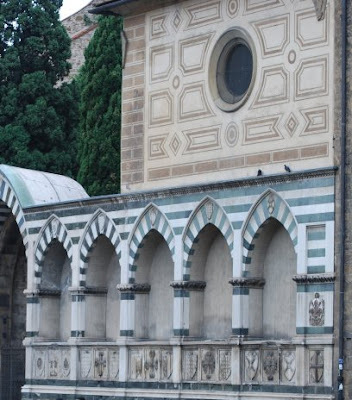 The Church of Santa Maria Novella in Florence has one of the nicest facades for the heraldry enthusiast that a building could have, I think. 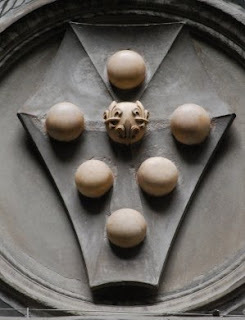 and twice more at the base of each alcove, separated by a panel containing a cross pometty, that is to say, with two pomels, roundels or knobs, at the end of each arm. The arms shown here, belonging to Soldanieri, given variously in Michel Popoff's Répertoire d'héraldique italienne, vol. 1, as Vair a bordure compony or and gules, Vair a bordure compony or and vert and Vair a bordure compony vert and or. The arms in the photographs here appear in the second alcove from the right (or the second alcove from sinister) in the first picture above. They are not hatched at all, so determining the tinctures from the carvings themselves is not an option. What a great display of heraldry! New Balance, a company that makes sneakers (what when I was growing up we used to call "tennis shoes", but those days are long gone, along with my tennis game) has come up with a new marketing gimmick. They have put out a line of eight sneakers, their New Balance H710 Ivy League Collection. And what makes this collection special? All eight Ivy League colleges and universities are represented in the collection (Brown, Columbia, Cornell, Dartmouth, Harvard (or as it is pronounced in Cambridge, Massachusetts, "Hah-vahd"), Penn, Princeton and Yale), and each pair of shoes is fitted with a custom tongue tag that uses that school's official logo, most of which are coats of arms. 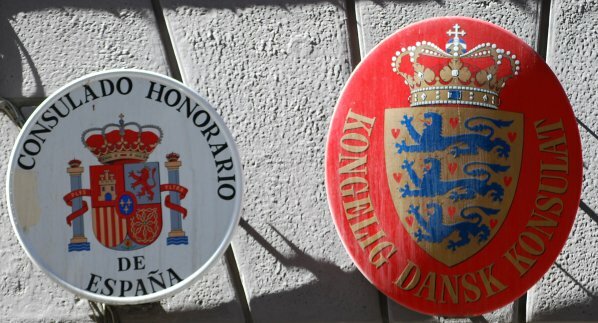 I’ve often thought that heraldry could be used to make a statement. 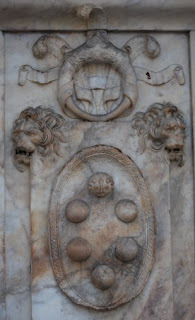 Indeed, for an example of just that, see the arms of Pope Leo XI in my post of January 10. But sometimes the statement being made may possibly be considered to be one of more than simple family pride or something similar. 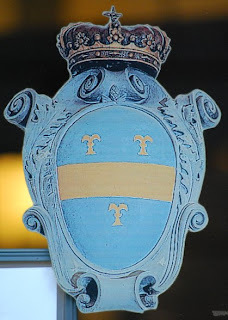 As to the family whose arms these are, according to the Stemmario Fiorentino, there are two families to whom this coat could belong: both Canigiani and Paganelli are shown to bear: Argent, in pale a label of three points gules and a crescent azure. The Répertoire d'héraldique italienne, vol. 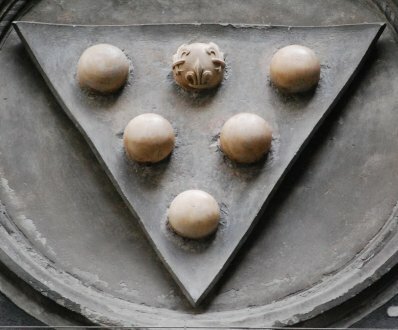 1, Florence (1302-1700) by Michel Popoff (why, yes, I did go out and buy some heraldry books so I could look up and learn more about the coats of arms we saw in Florence) confirms that identification. 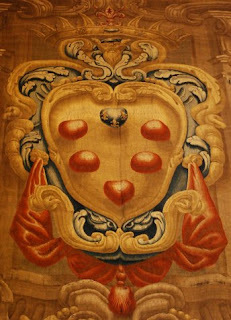 And Florentine Heraldry: A Supplement to the Guide Books by Howell Wills notes that Paganelli is a branch of Canigiani, hence the use of identical arms. However, the Répertoire also gives Covoni, Or in pale a label of three points gules and a crescent sable. Although given the comparative numbers of coats identified in the Répertoire (five Canigiani versus two Paganelli versus three Covoni) might lead you to suspect that the arms are those of they Canigiani/Paganelli families, they are in fact those of Covoni, appearing as they do on the wall of the, oh, yeah, Palazzo Capponi Covoni. The powers that be who are pushing for HTML5 have created a new logo for the "brand". At least some of them seem to be of the opinion (shared by a few bucket shops I know of, among others) that, if you put it on a shield shape, it's a coat of arms. Or a crest. Or a badge. Or something like that. "Simultaneously a badge of honor and a coat of arms, this crest represents the spirit and substance of the open web platform and the forward thinking community making it a reality." Reminds me a bit of some of the alleged "meanings" that you can sometimes find supposedly given to the various tinctures and charges in heraldry. Most of which are completely made up. It stands strong and true, resilient and universal as the markup you write. It shines as bright and as bold as the forward-thinking, dedicated web developers you are. It's the standard's standard, a pennant for progress. And it certainly doesn't use tables for layout. We present an HTML5 logo. So it's a logo, it's a badge, it's a coat of arms, it's a crest, it's a standard, and it's a pennant. Wow. 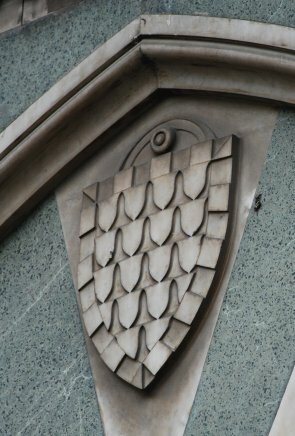 I knew that heraldry could be versatile, but this exceeds even my apparently limited knowledge. 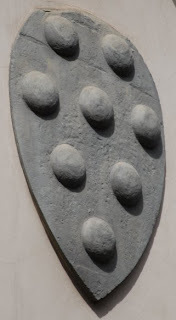 Of course, I might be more impressed if it were really heraldry. But it isn't, so I'm not. In this case, I'd been updating the Speaker page on my website (www.appletonstudios.com/Speaker.htm) and thought I would check on the web to see if any announcements had been made on-line yet about a conference later this year at which I'd been asked to make some presentations. And, sure enough, there it was, with its very own webpage: http://www.angelina.edu/genealogy/genealogy.html The 15th Annual Angelina College Genealogy Conference being held July 14, 15 and 16, 2011, on the campus of Angelina College in Lufkin, Texas. And scrolling down the page a little way, under "Visiting Faculty," was yours truly, the author of this modest blog. I'm really looking forward to attending this conference, and the chance to introduce heraldry to another group of people who probably know only a little bit about it. Not to mention the opportunity to make some new friends and to learn some more about my related interest, genealogy. Not to mention the delight at seeing my own name in print. Or at least in typeface on my computer screen. I’m not going to say that much on this post; it’s going to be mostly pictures of the various ways in which I saw the de’ Medici arms (which I introduced in the previous post) depicted: differently shaped shields, different numbers and arrangements of the roundels, different placement of the augmented roundel, and so on. 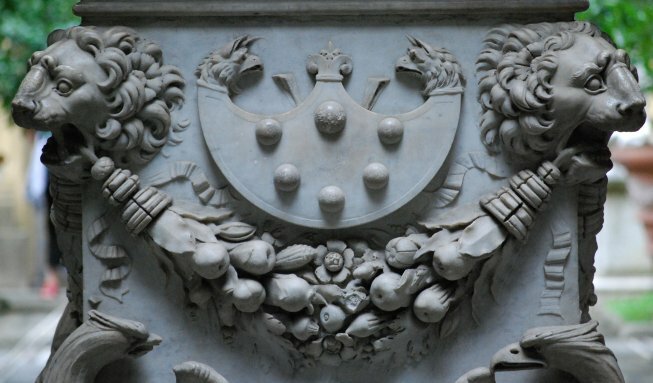 It’s a truly amazing variety, but to me one of the joys of heraldry is seeing the ways in which different artists will depict the same coat of arms. 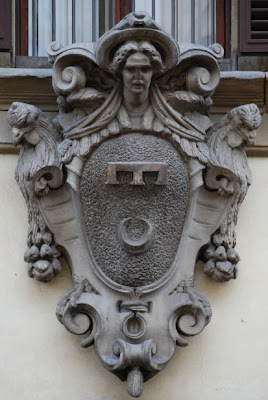 In the next two or three entries to this blog, we’re going to discuss the one coat of arms that can be found more frequently than any other in the city of Florence. Surprisingly, this coat is not the arms of the city of Florence, nor even the arms of the people of Florence. It is, however, the heraldry of what is probably the most famous family of Renaissance Florence, the de’ Medici. 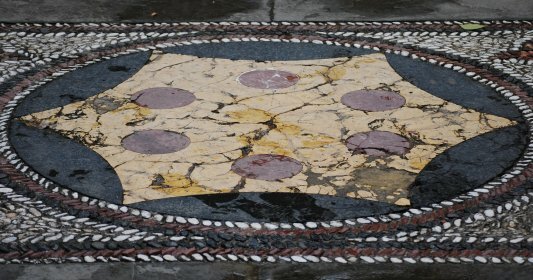 I won’t go into the history of the family - you can easily find that for yourself in any number of sources - except to note that the de’ Medici family produced three Popes, one of whom, Leo XI, has a very nice depiction of the family arms, deeply carved and painted and surrounded with the keys and tiara of the Papacy, placed prominently on the corner of one of the buildings of the city, as you can see here. The arms most frequently appear with the augmentation granted to them by Louis XI of France in May 1465, which changed one of the roundels (or in three-dimensional representations of the arms, three balls) from red to blue and added the three golden fleurs-de-lis of France to it, although, as below from a pathway in the courtyard of the Medici Riccardi palace, you will also see the arms without the augmentation. 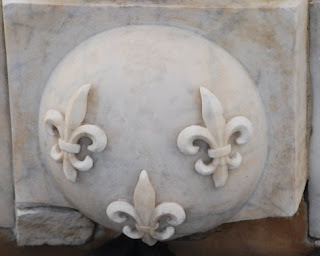 Indeed, there are places where the arms themselves are not displayed, but the augmentation, the roundel of France, will appear by itself, as here. 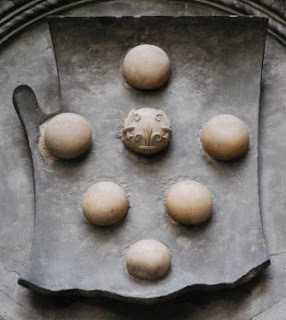 In the next post, we’ll look at some of the many variations of the arms than can be found in Florence. One of these two is, of course, the arms of the City of Florence, Argent a fleur-de-lys florency gules. 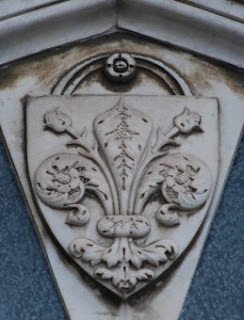 (The term “florency” in the blazon is described in Parker’s A Glossary of Terms Used in Heraldry as: “the fleur-de-lis is drawn sometimes with a ‘fleuron,’ that is, it has buds added to the flowers; it is then described as epanoui, or florencée.” I prefer to think of “florency” as meaning “a fleur-de-lis as used by Florence”, but that’s probably just me.) The arms of Florence are found all over the city, both plain and colored as can be seen in the two examples below. The other coat of arms encountered frequently about the city is that of the People (the popolo, from the same Latin root – populus - as the English term populace) of Florence, Argent a cross gules. 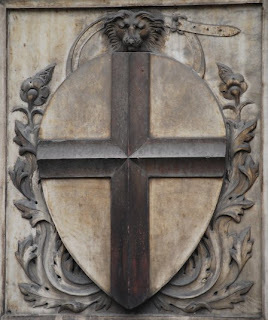 Yes, I am aware that these are also the arms of St. George, the flag for England (and incorporated as such into the Union Flag of Great Britain), Genoa, Italy (see, http://www.ngw.nl/int/ita/g/genova.htm), Milan, Italy (see, http://www.ngw.nl/int/ita/m/milano.htm), and about a dozen English families according to Papworth’s Ordinary of British Armorials, among other usages elsewhere. It’s a very “popular” coat of arms (if you’ll pardon the pun. Or even if you won’t). 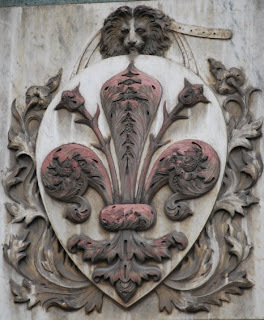 Be that as it may, it is also the arms of the people of Florence, and as such can be found all about the city almost as frequently as the arms of the city itself. And how cool is that! So here we are, beginning a new year, and here I am, about to present you with some of the heraldry that can be found in that jewel of the Renaissance, Florence, Italy. We were fortunate enough to have been able to spend nearly five full days in Florence last September. It’s a beautiful city, full of art, full of people, full of tourists! And full of heraldry. No, really! 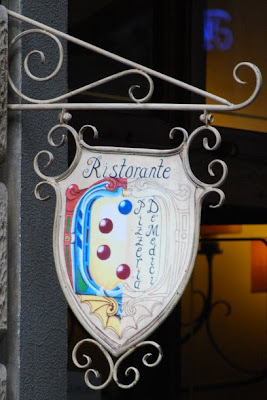 There were very few places we went in central Florence where we did not see a coats of arms. (And I’m pretty sure that at least one of them was really an alley and not a street.) We walked down some streets where it was easier for one of us to walk down one side taking pictures of the heraldry on the other side, while the other one walked down that side taking pictures of the coats of arms on the first side, there was so much to see and photograph. 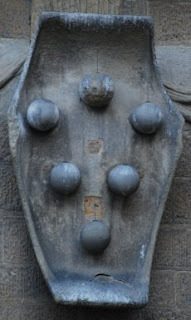 And our introduction to heraldry in Florence began at the entrance to our hotel. The Hotel Paris is just around the corner and down the street about a half a block from the Piazza Santa Maria Novella. It’s a great little hotel, and I’d happily stay there again. But we stepped out of our cab from the airport, and there it was … heraldry. 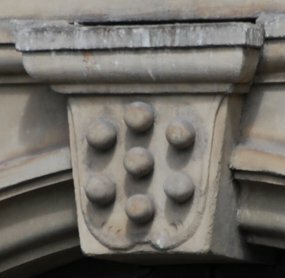 The arms used by the hotel as its logo (Azure a fess between three chess rooks or) are clearly not those of the city of Paris, but I suppose might possibly be a variation of the arms of Paris de la Brosse found in Rietstap’s Armorial Général, Azure a fess between in chief three roses and in base a tower or. Or not. In any case, it was an auspicious beginning for a heraldry enthusiast like myself, and I looked forward to seeing more. Little did I know then just how much more I would see!